Man in a local market in Morocco. photos by Kathryn Weir. 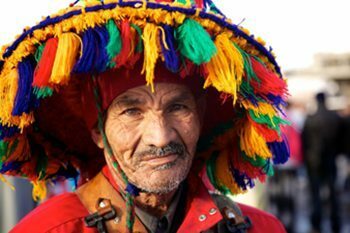 Whatever your particular personal taste in photography, magical and diverse Morocco has something for everyone. Whether you prefer lively street scenes, sweeping landscape vistas or travel portraiture you are sure to be satisfied with the offering. 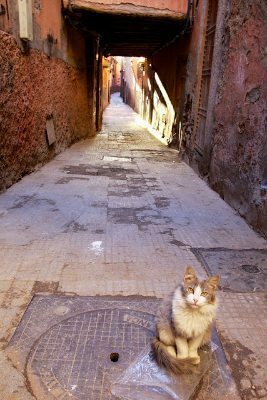 The streets of Marrakech with their distinctive blend of French colonial and Arabic cultures offer a veritable smorgasbord of street scene photographic opportunities. The High Atlas and anti-Atlas Mountain ranges offer beautiful landscape vistas as does the incredible Sahara desert. 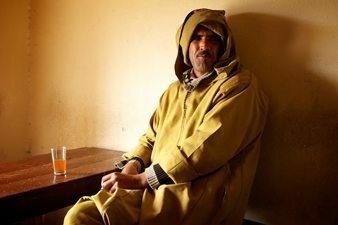 The friendly and approachable people dressed in their distinctive Berber Jellaba make a fine study in travel portraiture. As with all places, there are certainly some challenges to photography in Morocco. I have included here some tips below which will make your photographic endeavors less stressful and more productive. So, whatever your particular interest here are a few tips to help you make the most of your visit and return home with memory cards full of photos you will be happy to show off to your friends. Whilst these tips have been written with Morocco and Marrakech in mind they can certainly be applied to many varied travel destinations you may choose to photograph. One challenging and admittedly stressful side to travel photography comes into play when we try to take photographs of local people. Many people often ask what the secret to good travel portraiture is and will often comment that they feel too frightened or intimidated to photograph people for fear of making the person angry. with 25 stories about Morocco to go on Kindle, Nook or iPad! This is a quite valid concern and I do sympathize both the with photographer desperately hoping to get some holiday magic in camera and also with the subject trying to go about their daily business without the somewhat confronting and intrusive act of having a long lens pointed in their direction. 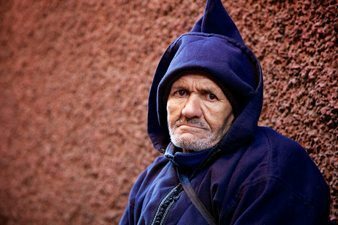 Keeping in mind that Marrakech has become a vibrant and very busy tourist destination many of the locals may be feeling increasingly like they are being placed on display or under a microscope- and highly likely multiple times in any one given day! So before you race up to your next "study" consider how you may feel if you are busily trying to complete your work or tasks for the day and someone kept popping up to photograph you in the process...intimidating alright! An interesting and efficient by-product of this is that there has sprung up an unofficial "trade" of sorts whereby it has become the accepted practice for tourists/travelers to pay for photo opportunities. 10 Dh (about USD 1) is such a small portrait fee for such a wonderful model. A few cents is very much worth it for a portrait like this, don't you think? The commonly accepted rate is Dh 10 per "session" where you can offer to pay your chosen subject for a chance to take a few quick snapshots before they resume their daily tasks. Of course, some people may not expect payment at all so I found the best way to tackle the situation was to arm myself with a whole pocket of dirham coins. When wandering the streets camera slung around my neck, if I saw someone I thought might make a good study, I would lift the camera to about shoulder height but without aiming it at the person- I would offer a big smile and point to the camera with a questioning look on my face and point to them. It generally gets the question across without having to learn the local language. Keep a sharp eye out as you look for potential subjects for their body language and hand signals. Most of the people I came across were very clear in holding a hand up in front of their face, once they saw a camera, even when they were some distance away if they didn’t want to be photographed. Women will rarely allow their photograph to be taken. It is better to understand and accept that at the outset. As with all photography patience in portraiture will be rewarded. I often find it is better to establish a rapport with someone before attempting to photograph them. In many instances, you will be wandering markets and the colorfully dressed vendors make wonderful subjects. Why not look at their wares, buy something, smile and make chit-chat and they will be much more inclined to allow a photograph of them in front of their beautiful wares. This will undoubtedly afford you a much better memory of your adventure and interaction than random photos of nameless unknown subjects. Marrakesh's winding alleyways are quiet and peaceful in the early morning. Frame your subject to the side, rather than right in the middle. One essential piece of knowledge a travel photographer must carry at all times is how to say thank you in the native language. Remember at all times you are the stranger in a strange land and you will get so much further with respect, a big smile and (in Morocco) a pocket full of change. Marrakech abounds with opportunities and subject matter for fabulous street photography. Whether you are drawn to the busy souks or enjoy wandering the rustic and charming little alleyways you are sure to find something to catch your eye. Patience is key again and if you can find yourself a lovely little quiet café or seat on the edge of a busy square you will have a much better opportunity to capture some great candid shots- not to mention enjoying some of the local mint tea whilst you wait. Another added benefit to this approach is that once you are seated and sipping your refreshment you are on a much more even footing with your audience rather than rushing at them with a camera. Marrakech like many other cities is a bustling and lively place until well after sundown. The advantage of this is that it is often fairly slow to get started in the morning so if your passion is deserted little alleyways or photographing some of the hundreds of thousands of amazing rustic doorways then this is the time for you to be out and about. The early bird truly does catch the worm. One of the things I noticed about Marrakech is that from about mid-morning the city is quite busy and so there are often crowds of people in the streets which can give a somewhat cluttered feel to photographs. Most mornings I left the hotel before breakfast- had a magical solitary hour wandering the streets and alleyways getting a photo fix then was back in time for some wonderful Moroccan breakfast. Another advantage to this approach is that it is actually possible to get to those street scenes before the very harsh sunlight which gives very difficult conditions for correct exposure. If you are out in the middle of the day when there is lots of activity be sure to use high ISO and fast shutter speed so as to be able to freeze all that activity especially in the shady winding little alleyways and the dimly lit and frenetic backstreets of the souks. Early morning light in Marrakesh, Morocco. Kathryn Weir photo. Once you are out of the Medina and the bustling city there are many opportunities for landscape photography. Obviously, a tripod would come in handy if you are planning on early morning or evening shoots where the light may be less plentiful. There are many little villages as you wind your way up into the High Atlas Mountains and it is an invaluable exercise to be able to leave your car and wander these lovely villages. A good guide is essential and our driver/guide was superb and very patient with his photography guests. In the end, he was actually pointing out things he thought would make good subject matter. The Sahara was another fantastic opportunity to explore some landscape photography. We stayed in a bivouac overnight and I desperately wish we had booked 2 or even 3 nights as one sunrise and one sunset just simply was not enough. *Be very careful to protect your camera gear from sand and dust- plastic bags are a cheap but invaluable commodity in a desert dust storm. Camel driver in Morocco. The golden sunlight is best in the morning. *If you want endless sand dunes devoid of footprints or tire tracks be prepared to trek a good distance to get them. *Take along extra camera batteries –they will run out of power faster in the cold. *Take extra Memory cards- they will fill up and there are no handy shops to pick up another in the middle of the Sahara. Consider, if using a tripod, that the legs will readily sink into the sand which may give movement on long exposures. Consider taking some plastic cups along to pop under each leg which will spread the weight and stop this happening. Not only is it cold in the desert it is also quite dark predawn with no nearby cities giving light. Take a torch to light your way, read your camera settings and stay safe. Dunes look a whole lot better if you can catch them before anyone has tracked across them! Take a flashlight. Enjoy Morocco! Love Morocco? Buy our Morocco Plane Reader with 25 stories about Morocco to go on Kindle, Nook or iPad!